I stood on the pier squinting into the sunlight as my husband’s ship drifted out of the harbor. The sailors standing at attention on deck were barely visible, just tiny white dots transfixed on the horizon. In the background I could hear the faint sound of Lee Greenwood’s “God Bless the USA” playing over the intercom. Little by little, family members, friends, and loved ones began turning around and walking back to their parked cars. All of us strangers, but all in this together. For some seasoned military families, this deployment was nothing; routine, normal. 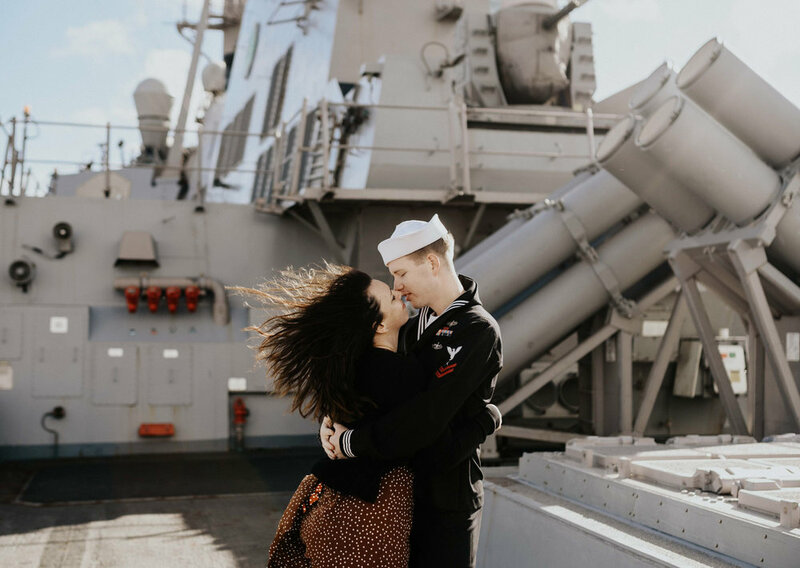 For others (like me), this deployment was daunting: seven months separated by thousands of miles with little communication, a smattering of phone calls, and a tentative return date. I turned around to head back to my car. No one said anything -- what was there to say? We’d all meet again in seven months to greet our sailors and thank God they made it home in time for Christmas. I drove the four and a half hours back to Augusta, GA, from Jacksonville without stopping, listening to podcasts, drinking stale Starbucks coffee. I wanted to wallow for a bit in self-pity. I wanted to binge-watch Netflix and eat an entire pizza because for the next seven months I wouldn’t have to compromise with anyone on pizza toppings or Netflix movies. But thank goodness for community, for true friends, and kindred spirits. As soon as I returned to my car, I noticed text messages from my parents and siblings, in-laws, and sweet friends with encouraging words, thoughtful prayers, and invitations to coffee or dinner so I wouldn’t be alone. To be honest, if not for community, this deployment could easily have been the laziest and loneliest season of my life. It was through this deployment I learned what true community looks like. I learned why community is essential for life. I discovered this truth so profoundly stated by C.S. Lewis: “Friendship is unnecessary, like philosophy, like art .... It has no survival value; rather it is one of those things which give value to survival.” I did not require friendship to survive a seven month deployment. But friendship made the deployment bearable, and not only bearable, but life-giving and sweet, nurturing and redemptive. They say everything goes wrong during deployments: deployments are when the A.C. overheats, the car breaks down, and the pipes burst. I’ll never forget the day my car was broken into on a sunny afternoon in a crowded parking lot. The driver’s side window was smashed and my purse stolen along with credit and debit cards, my social security card, driver’s license, military I.D., and a beloved leather wallet. I felt overwhelmed in the moment, and embarrassingly broke down in tears while calling the police department and credit card company. And then I called my friend Kacey because in that frustrating and violating moment I knew I needed a friend. Kacey showed up in 20 minutes with her entire family and Jones (the family golden retriever). Kacey’s husband, Stephen, went out and bought two bottles of red wine, chocolate, and a lottery ticket. He vacuumed the glass shards and fingerprint powder from the front seat while I called the insurance company and drank a large glass of Bogle Merlot on the family couch with Jones nudging his golden head beneath my unfree hand. I didn’t need friendly intervention to survive what truly was a minuscule break-in. But this extension of friendship, the intentional hospitality from a family that saw my hurt and defeat, and went above and beyond to care for my wounded soul meant the world. It offered value to a bleak and infuriating situation. Friendships in Augusta did not come quickly. We moved to the area two years before my husband’s deployment. I thank God for perfect timing. Those first few months were lonely and isolating. We struggled connecting and valuing the city that would be our home for the next three years. It took nearly eight months to find a church and begin forming genuine friendships. I met Kacey through Facebook though our friendship didn’t truly begin until months later when she sent a message inviting a virtual stranger over for dinner. It’s hard to believe we were once strangers as they have become more than friends since that first initial meeting. They are our family. Our community. Over the past few years we connected more with this city and the people who live here. We left our lonely base housing and moved closer to the city center. We got involved in a church, met more people through social media (surprisingly), and through other friends. And by the time this deployment rolled around, as hard as it was, we knew I would have community to fall back on and solid friendships to see me through the rough and lonely days. We missed celebrating several key events together this past year, including my thirtieth birthday, our five year wedding anniversary, and Thanksgiving. But I was never alone. My husband threw me a birthday party (though a continent away), and invited dear friends to come out for cupcakes and pitchers of beer at our favorite local brewery. I spent our wedding anniversary with two girlfriends sharing a romantic meal of bread, cheese and wine, laughter and late-night conversation. Thanksgiving, as usual, meant all of my siblings, cousins, parents, aunt and uncle, gathered together under one roof for a few days -- a welcome distraction. Genuine and intentional community is essential. It offers value, provides beauty, hope, and purpose in what would otherwise be a dreary world. Community is the gathering of individuals who may have nothing more in common than the friendship that unites them. It’s more than occasional, surface-level exchanges or social media connections. It’s relationships that emerge through shared life experiences: an open and crowded dinner table, coffee dates with strangers that end in promises of more coffee and more conversation, purposeful visits with old friends in new homes, shared projects with common goals. It’s champagne and weird Netflix originals with new friends. It’s bonfires and semi-burnt marshmallows on a crisp autumn evening. It’s another pair of hands to help install a new IKEA light fixture. It’s ice-cold Topo Chico and theology on the back porch. It’s kids Halloween parties, and Friendsgiving potlucks. It’s messy and inconvenient, and sometimes tear-filled and frustrating. It’s beautiful and encouraging, challenging and uplifting. As Lewis so wisely said, we can indeed survive without friendship and community. But what kind of a survival would that be? It was through a tough season that I witnessed genuine community in action. Adult friendships are difficult, the life of a military family especially so with constant moves to new and friendless places. But because of the military and this deployment, I’ve learned community exists in every pocket of this world -- it’s just a matter of finding it. We’re all in this life together. We all want to know and be known, and we all hunger for the value of a friendship-filled life. Sarah Southern is a freelance writer and graphic designer, bookworm, and coffee enthusiast. Sarah and her husband, Jordan, live in North Augusta, SC, with their rescue dog, Lucy.